There we go, first movie on my blind spot list checked off. I have been putting this off for years, and not so much intentionally as that I keep forgetting that it needs to be watched, and when I remember, my other half rejects the idea of a political film. So not his thing. So now I had to watch it, and I had to make the time. It was on a list, right? Right. 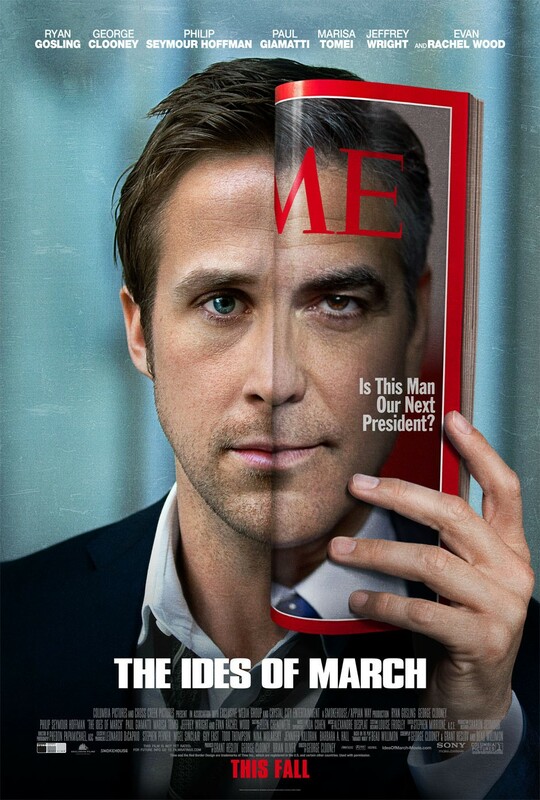 The Ides of March was a smart and engrossing film. That is the first thing that I would like to say. From the opening scene and from thereon out, it demands your attention, and I’ll bet you it will receive it. Ryan Gosling gives another hell of a performance here, though it is something I have come to love about him. He is very talented. It was really great to see how Stephen preps all of Morris’s stuff, and practices and tests it, and how phenomenally different it sounds when you see Clooney step up as Morris and pull it off. Evan Rachel Wood was good again, as was to be expected. I liked the story for this quite a bit, and thought that it was pulled off really well. Philip Seymour Hoffman was at his finest here, and captured the essence of his jaded character perfectly. He exuded the power and control he was supposed to, and owned every second he was on screen. The whole cast was solid, and all contributed really good efforts that are seen throughout the film. I thoroughly enjoyed the pacing, how everything starts gradually and then just snowballs into this huge and out of control situation, with everyone stabbing someone else in the back, and Stephen learning all about how being an idealist is a really difficult thing to be in his line of work. I actually enjoyed the romance between Stephen and Molly, and really wished that the movie had focused on that a little bit more, giving it some more meat. Overall, I think that The Ides of March was a successful political drama all around that I would recommend if this is your scene. It was definitely my cup of tea. This entry was posted in Movies and tagged Evan Rachel Wood, George Clooney, Jeffrey Wright, Marisa Tomei, movie reviews, movies, Paul Giamatti, Philip Seymour Hoffman, politics, Ryan Gosling. Bookmark the permalink. Great review Bkushi. I should probably watch this soon as well. Thanks Kidney! I really liked it! Good stuff Zoe. I thought this was an okay movie but wasn’t crazy about it. I have always said it has one of the coolest movie posters ever made! The poster is really cool! Ah, I love political spins on things and the like, so I was highly entertained. This is a great little film that I think is highly underrated. Great performances all around and it made politics not boring. Thanks Cale! Glad to see it getting some love. I thought it was very well constructed! I’m not big on political movies either – I usually get quite bored and fidgety. You know I’m a big fan of Clooney though – think I would like this? Good review Zoe. The cast is very good. However, the material itself takes a strange turn about half-way through and it makes the movie a tad disappointing. Thanks Dan. I must say, it didn’t play out even remotely like I thought it would. I am stoked to hear this news about Ides; a movie I’ve been forever meaning to get to but it also for me keeps getting lost in the shuffle. I absolutely dig this cast, too. I had no idea it featured so many big names. Gotta find this one somehow, some way! Awwwwwwwwwww sorry to hear that! 😛 But you are here now! I hope you get to it. You might like it! I was impressed, and can see now why it has a group of people that love it. I also understand why there will be some that aren’t as taken, but this film incorporated the features I enjoy about politics and what not. I also loved this one and revisited a second time a couple of months after I’d seen it. The amount of great performances in this one is crazy, resulting in a very good film which kept me on the edge of my seat. It really was a solid flick Nostra, filled with mesmerizing performances. I can see that this is something I will return to! I’m not generally one for political drama but I do like Clooney and Gosling so this might be one to check out. Well, you might enjoy it for the performances alone! Not that much of a blind spot. An average film at best. Great poster though and great review Zoe! i love these kinds of movies and recall enjoying this when i saw it a few years back. i’m gonna rewatch it soon thanks to you and ur review Zoe! Thanking you kindly! I don’t know, if you like political drama stories, then you will most likely enjoy this. I just know it ticks my boxes nad I had a blast. Pffffff, Ryan Gosling wows most ladies 😛 Drive did it for me, finally. Hmmmm, shoot me, but I am no fan of Emma Watson, so I have no real opinion on it. He’ll probably deliver the goods way better than she will. Oh my goodness, Only God Forgives and The Ides of March aren’t even remotely in the same league. I had fun with this, though still not my favourite Gosling, either. DON’T EVER TOUCH ONLY GOD FORGIVES IF YOU CAN HELP IT.